You've taken the GMAT, your transcript is in order, and you're ready to apply to business schools. Your personal statement and the interview are your major opportunity to distinguish yourself from the pack and demonstrate your full potential. 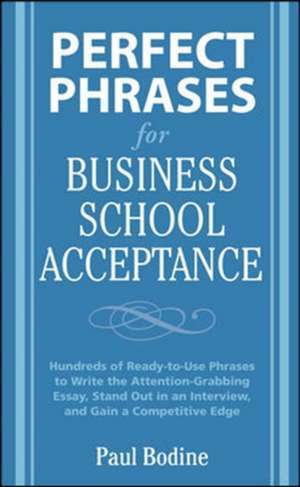 Perfect Phrases for Business School Acceptance gives you the phrases, statements, and approaches that will help you write a compelling essay, succeed at the interview, and stand out from your competition. Paul Bodine is one of America’s most experienced admissions consultants. Since 1997 he has helped hundreds of applicants gain admission to the world’s best business, law, and medical schools.